The first teaser has hit for Marvels upcoming Avengers series. 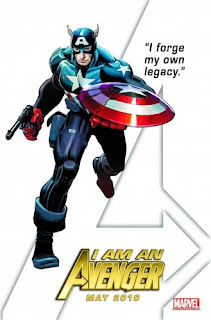 Featuring the Bucky 'Captain America' intent on forging his own destiny, the art is by John Romita Jnr, with the series to be written by Brian Michael Bendis. With JRJr also tapped to take over the art reins on Thor later in the year, today's news fuels rumours that when Avengers #1 debuts, it will be in a weekly format, similar to that of Amazing Spider-Man. This would give the hit artist enough time to complete the initial arc, before jumping over to the pages of the God of Thunder. One letter down, and presumably seven more to come, stay tuned to IADW to see who exactly will spell out the A V E N G E R S in 2010.